The New York Philharmonic deeply mourns the passing of Pierre Boulez, our bold and innovative Music Director from 1971 to 1977 as well as a trailblazing composer and thinker. The Philharmonic will dedicate its concerts taking place this week, January 7–9 and 12, featuring works by Sibelius, Richard Strauss, and Wagner and conducted by Music Director Alan Gilbert, to Boulez. We invite you to remember Mr. Boulez through music and through this slideshow of his time at the New York Philharmonic. For his New York Philharmonic debut on March 13, 1969, Boulez conducted Debussy’s Jeux and La Mer, as well as the Berg Violin Concerto and Varèse’s Intégrales. His performance of Stravinsky’s Le Sacre du printemps with the New York Philharmonic during that initial engagement prompted the Orchestra to engage him as its Music Director beginning in the 1971–72 season. In that post, and as Principal Conductor of the BBC Symphony Orchestra (concurrently, 1971–74), he broadened his repertoire to provide audiences with mixed programs of older classics and more recent music. Under Boulez, the Philharmonic introduced concert formats that brought the audience in direct contact with composers and performers, including the informal Rug Concerts and downtown Prospective Encounters. He returned in 1986 for a 14-event series highlighting his work as conductor, composer, and leader of the Ensemble Intercontemporain. In 1992 he celebrated the Philharmonic’s 150th anniversary in a concert also led by then Music Director Kurt Masur and fellow former Music Director Zubin Mehta. In the same year Boulez was made an Honorary Member of the Society, an honor shared by such figures as Wagner, Stravinsky, and Bernstein. The Philharmonic will dedicate its concerts taking place this week, January 7–9 and 12, featuring works by Sibelius, Richard Strauss, and Wagner and conducted by Music Director Alan Gilbert, to Pierre Boulez. We invite you to remember Mr. Boulez through music (and this slideshow). This program originally aired in celebration of his 90th birthday. 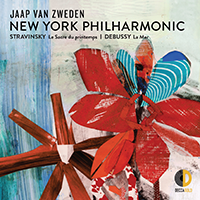 It features works by Wagner, Mahler, Stravinsky, Berg, Debussy, and Carter plus some of Mr. Boulez’s own music. The Maestro himself is also heard during the course of the program, speaking on a variety of topics.